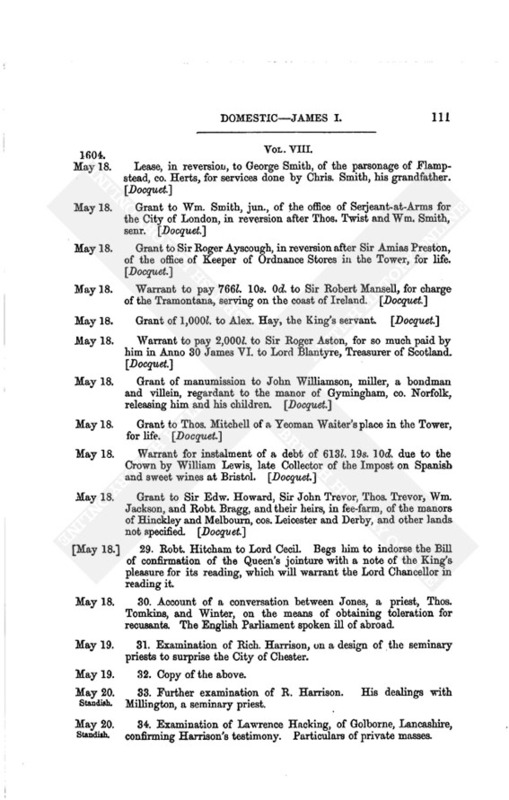 Calendar of State Papers Domestic: James I, 1603-1610. Originally published by Her Majesty's Stationery Office, London, 1857. 1. 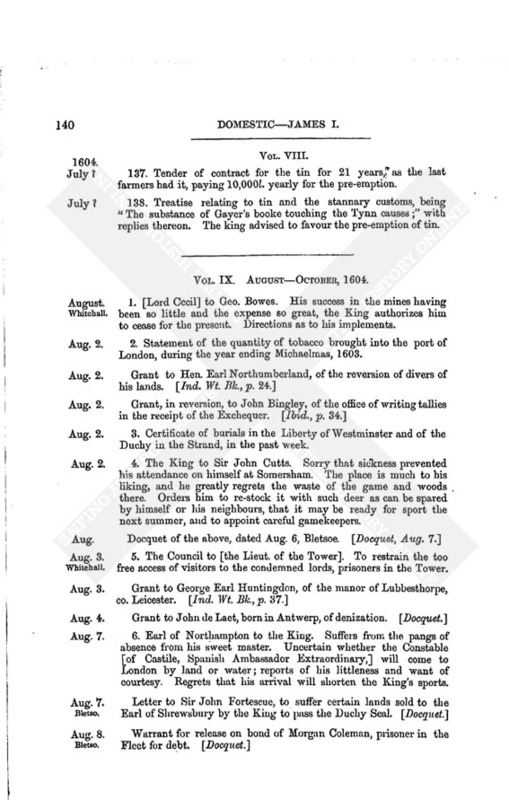 Account of the rent of assize of the whole soken of Somersham. 2. The King to the House of Commons. Urges them to dismiss jealousies, and appoint a commission to consider the terms of Union with Scotland. 3. Copy of the above. 4. Speech of the Speaker to the King, thanking him for his forbearance to press the Union at present, and his willingness to leave it to Commissioners; and authorizing the appointment of Commissioners to draw up an act for the Union. 5. Copy of the above. 6. [Proposed] draft of an Act to appoint Commissioners to treat of the Union. 7. Robert Ker Lord Roxburgh to Lord Cecil. Profession of obligation. The [Scottish] Parliament is prorogued; the country loyal and quiet. 8. Note of absurdities and imperfections in the bill of assarts. 9. Earl of Mar to Lord Cecil. 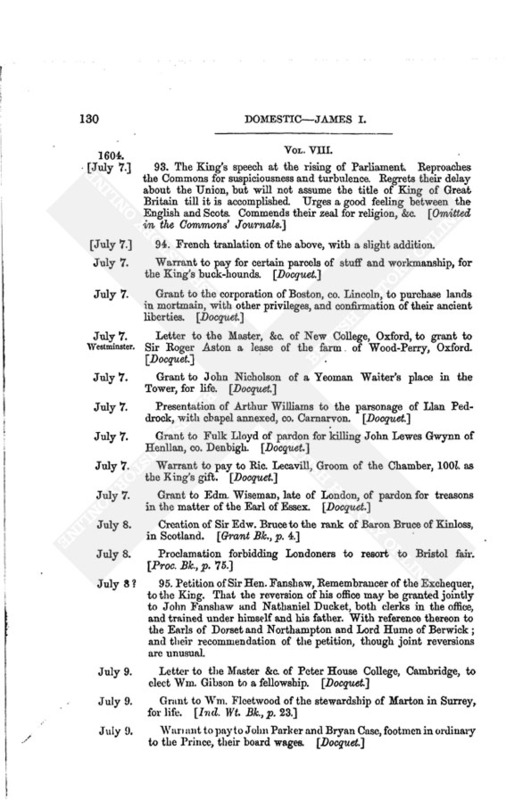 The Scotch Parliament is, by the King's direction, prorogued until July 3. Great opposition said to be made against the Union, by the English House of Commons. It has not yet been proposed in the Scotch Parliament. 10. Same to the Same. Since writing, has received his letter and is glad to hear that steps will be taken towards the Union; is ashamed to write the malicious speeches spread through the country about it. 11. Robt. Hitcham to Lord Cecil. 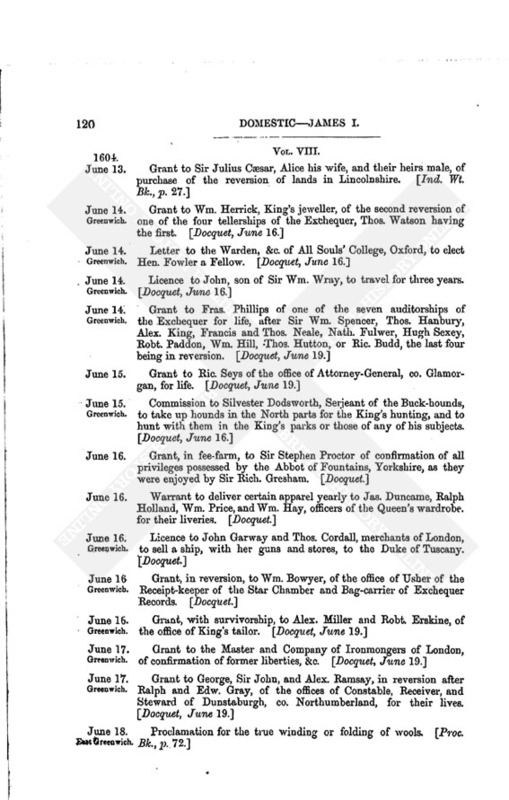 A book of the Queen's jointure is prepared, but the Attorney General delays perusing it, so that it cannot be engrossed and laid before Parliament. 13. The King to the Lord Chancellor and Lord Chief Justice. To examine whether the appointment of the garblers of spices belongs to the City of London or to the Crown. He has received many complaints against them, difficult of redress, as the Mayor and Commons, who are among the offenders, pretend to the disposal of the office. 14. Grant by the Queen to Wm. Gomeldon and Daniel Bacheler, of a chest of arrows, cast up as a wreck within her manor of Portland. 15. 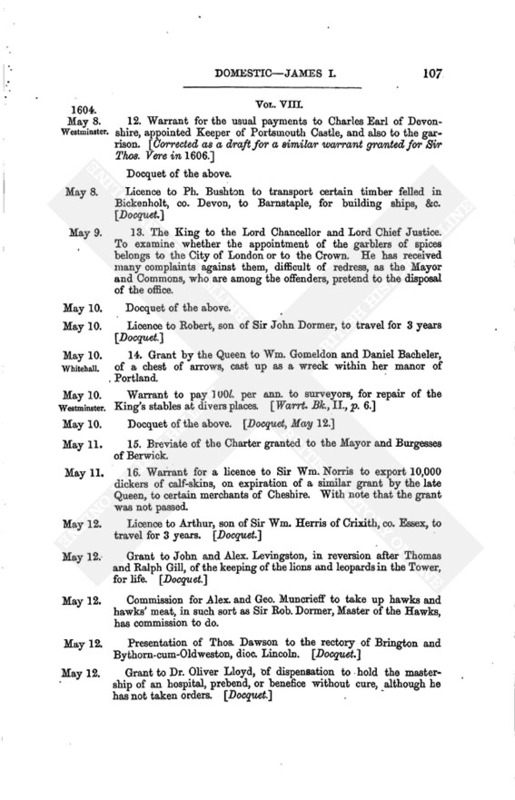 Breviate of the Charter granted to the Mayor and Burgesses of Berwick. 16. 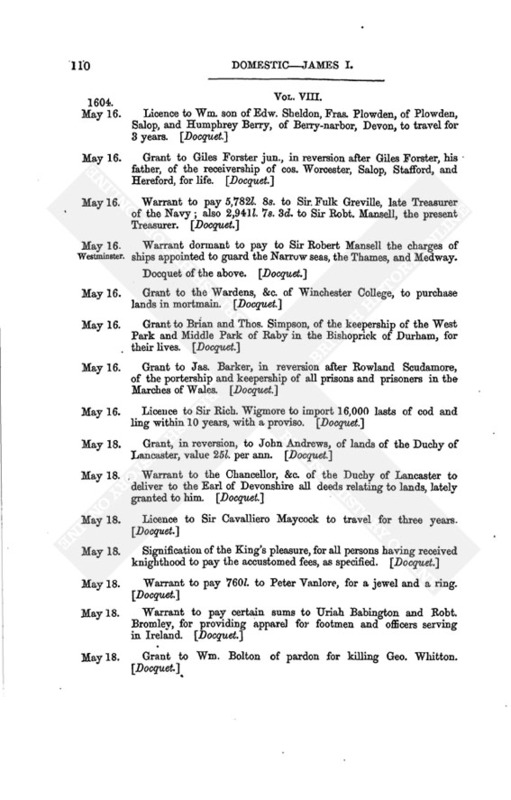 Warrant for a licence to Sir Wm. Norris to export 10,000 dickers of calf-skins, on expiration of a similar grant by the late Queen, to certain merchants of Cheshire. With note that the grant was not passed. Commission for Alex. and Geo. Muncrieff to take up hawks and hawks' meat, in such sort as Sir Rob. Dormer, Master of the Hawks, has commission to do. 17. Lord Treasurer Dorset to Sir Thos. Lake. To pass a Privy Seal prefixed, to be made in accordance with that of the late Queen, for warrant to pay 1,460£. 16s. per month to Uriah Babington and Rob. 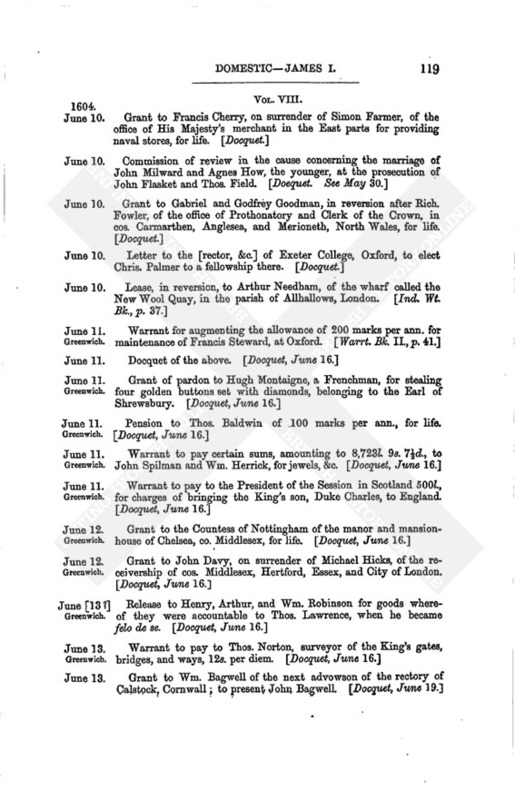 Bromley, merchants of London, for supply of monthly charges of the garrisons at Flushing and the Brill. 18. 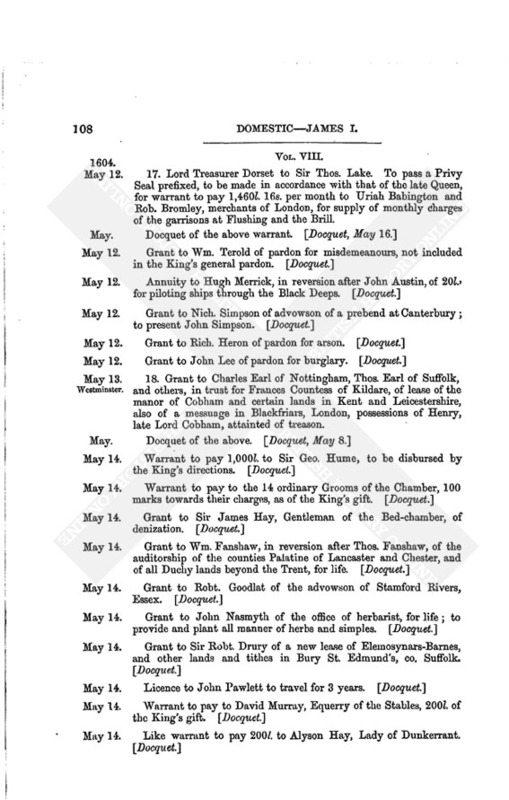 Grant to Charles Earl of Nottingham, Thos. Earl of Suffolk, and others, in trust for Frances Countess of Kildare, of lease of the manor of Cobham and certain lands in Kent and Leicestershire, also of a messuage in Blackfriars, London, possessions of Henry, late Lord Cobham, attainted of treason. 19. Lord Treasurer Dorset to Capt. Wm. Bowyer. 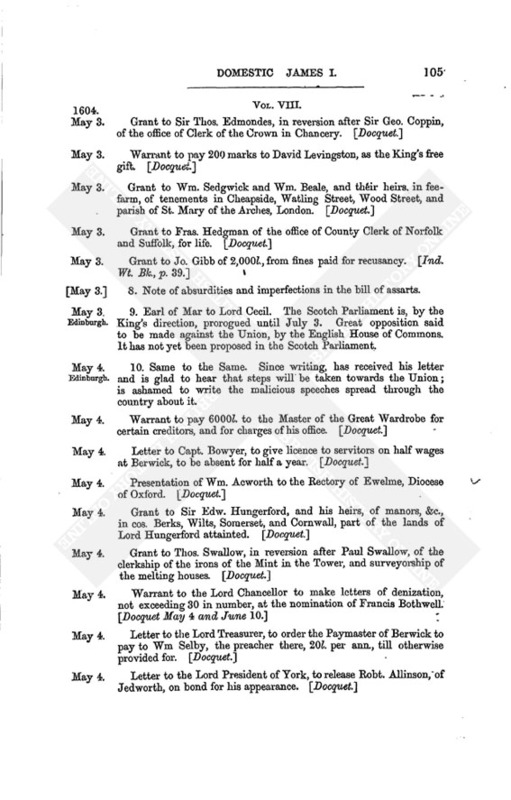 Requests him to advance, on promise of repayment, the quarter's pay of the garrison at Berwick, the Exchequer being drained by the King's "urgent occasions." 21. Act for declaration of certain practices of the Bishop of London to be treason ; the publishing traitorous and Popish books, &c.
22. "Information of Wm. Jones, printer, against the Bishop of London," for protecting the printers of Popish books. 23. Examination of Wm. Jones, printer, before Sir Edw. Phelips, Speaker of the House of Commons, on his delivering to the Speaker the above "Act" and "Information." 24. Examination of Ant. Earbery, as to the composition of the above "Act." 25. 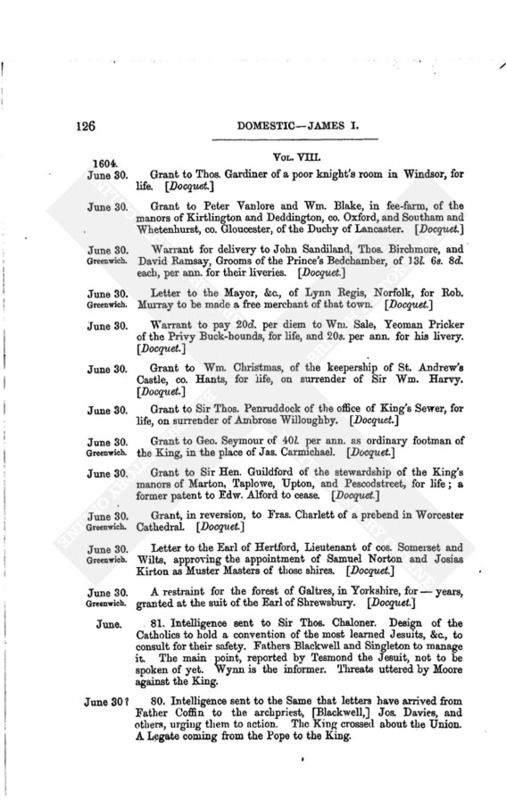 Petition of the Same to Lord Cecil. Excuses himself for drawing and exhibiting the bill for which he is in durance; prays for his release. 26. 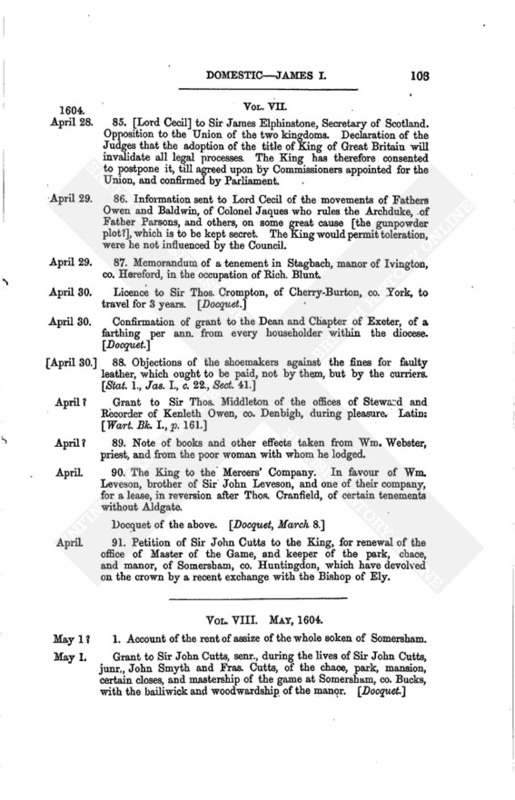 Notes concerning the method of summoning to Convocation, of the proceedings therein, and of the ratification thereof by the King, at his pleasure. 27. Copy of the above. Headed Dudley Carleton. 28. Minute sent to Sir Thos. 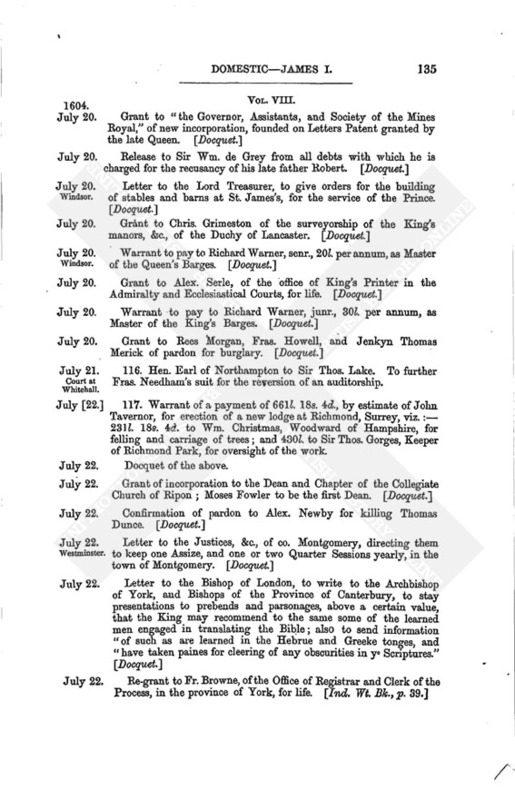 Lake, for a letter to be drawn up from the King to the Bishop of London, as President of the Convocation, commending to the Convocation the consideration of the "Book of Articles" for uniformity in religion, drawn up in 1562, and confirmed in 1571. 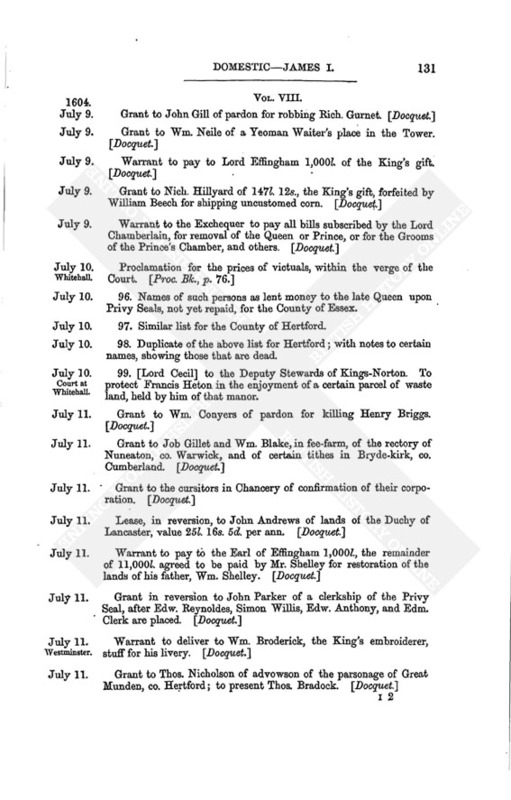 Warrant dormant to pay to Sir Robert Mansell the charges of ships appointed to guard the Narrow seas, the Thames, and Medway. 29. Robt. Hitcham to Lord Cecil. 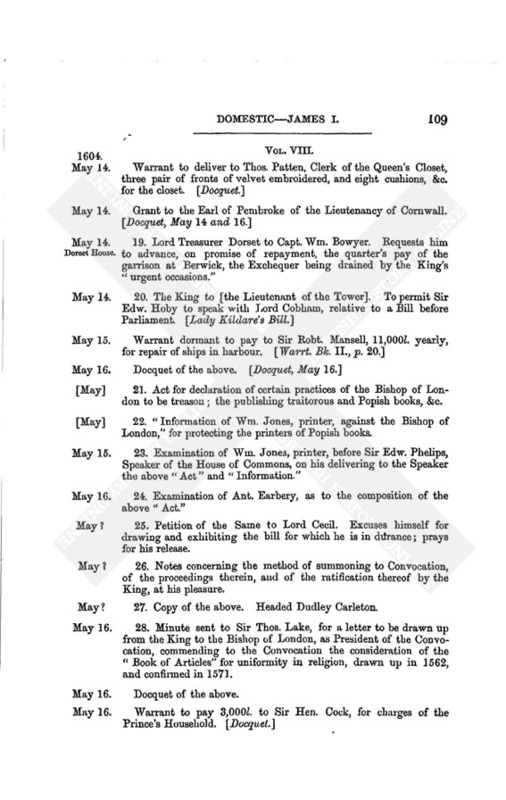 Begs him to indorse the Bill of confirmation of the Queen's jointure with a note of the King's pleasure for its reading, which will warrant the Lord Chancellor in reading it. 30. Account of a conversation between Jones, a priest, Thos. Tomkins, and Winter, on the means of obtaining toleration for recusants. The English Parliament spoken ill of abroad. 31. Examination of Rich. Harrison, on a design of the seminary priests to surprise the City of Chester. 32. Copy of the above. 33. Further examination of R. Harrison. His dealings with Millington, a seminary priest. 34. 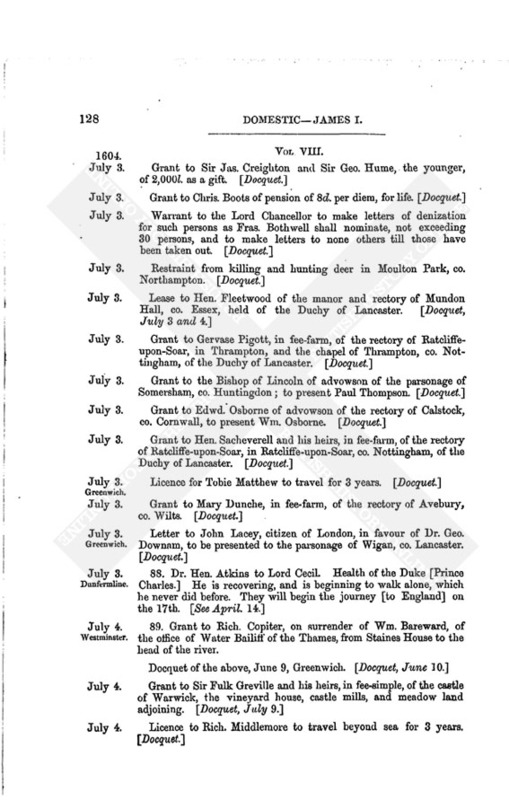 Examination of Lawrence Hacking, of Golborne, Lancashire, confirming Harrison's testimony. Particulars of private masses. 35. List [by Thos. Wilford, President of the Spanish Merchants' Company,] of goods manufactured in Holland and Zealand, imported to England and thence exported to Spain, &c.; with note that English cloth sent to Holland is often exported to Germany, &c.
36. 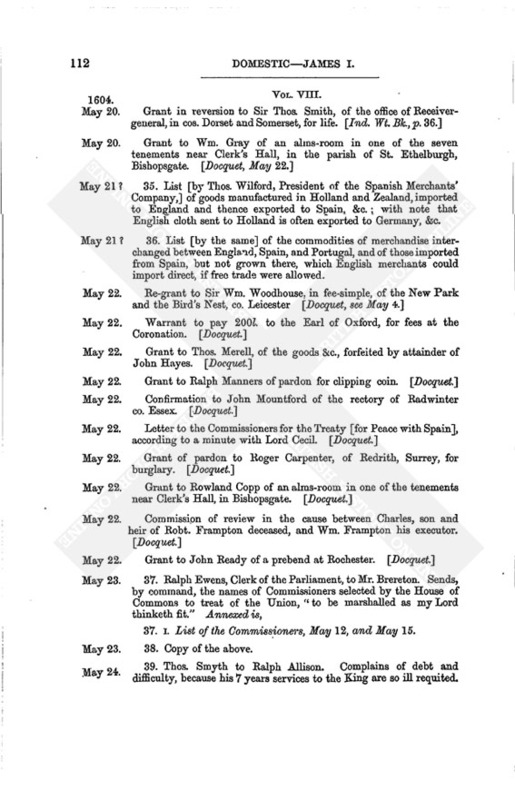 List [by the same] of the commodities of merchandise interchanged between England, Spain, and Portugal, and of those imported from Spain, but not grown there, which English merchants could import direct, if free trade were allowed. 37. I. List of the Commissioners, May 12, and May 15. 38. Copy of the above. 39. Thos. Smyth to Ralph Allison. Complains of debt and difficulty, because his 7 years services to the King are so ill requited. 40. Wm. [Segar], Garter, to Sir Hen. Gawdy. On the dignity and precedency of the several orders of knighthood. 42. 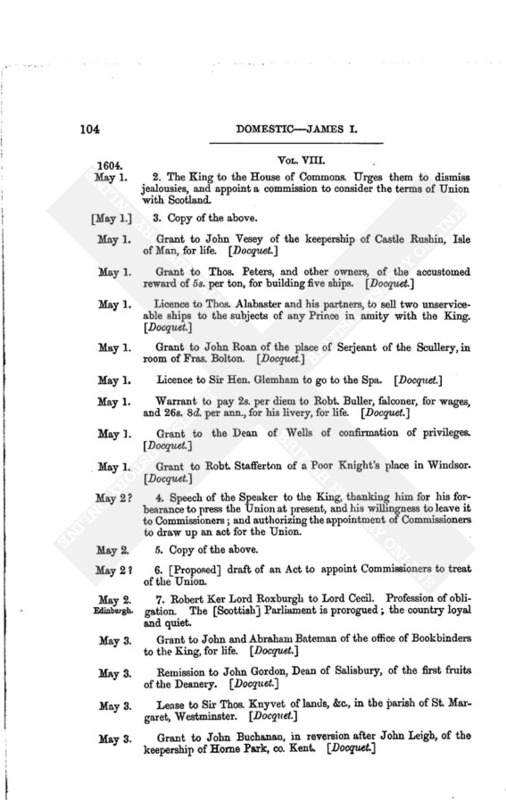 Warrant to the Earl of Devonshire, to send down sufficient persons to remove the brass ordnance and other munition from Berwick to the Tower. 43. Warrant to Captain Wm. Bowyer, in charge of the garrison at Berwick, to permit the removal of the same. 44. Wm. Reede to the Council. Sends up Edw. Smith, late soldier of Carlisle, in custody. Wm. Hatton, Deputy at Carlisle, would not take charge of him. 45. George Bowes to Lord Cecil. Gives account of his proceedings in search for gold. Impediments from the weather and illness. Has disbursed his grant of 300£. Will spend 200£. of his own, in trying to hit upon a vein of gold, but will not buy gold and pretend it is found there. 46. 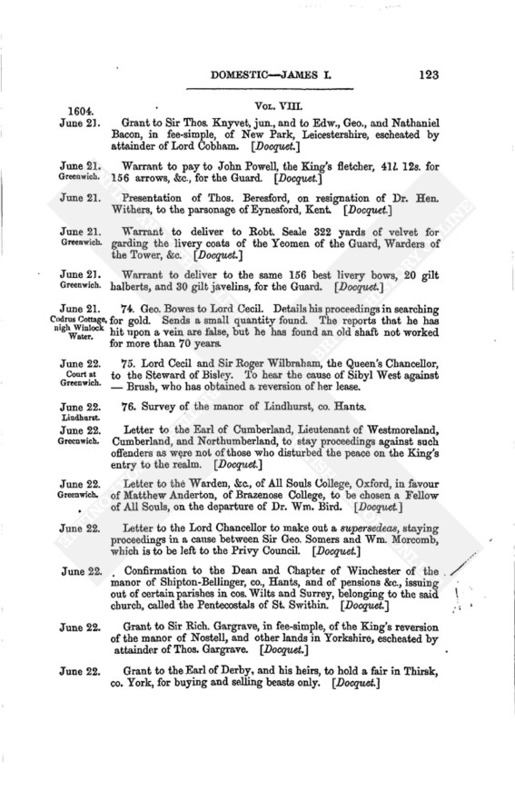 Warrant for a grant to the Countess of Northumberland of lands, value 500£. per ann., late in the possession of Sir John Perrot, her father, attainted; her former pension of 400£. per ann. to cease. 47. Draft of the above. 48. Lord Treasurer Dorset to [Sir Thos. Lake.] 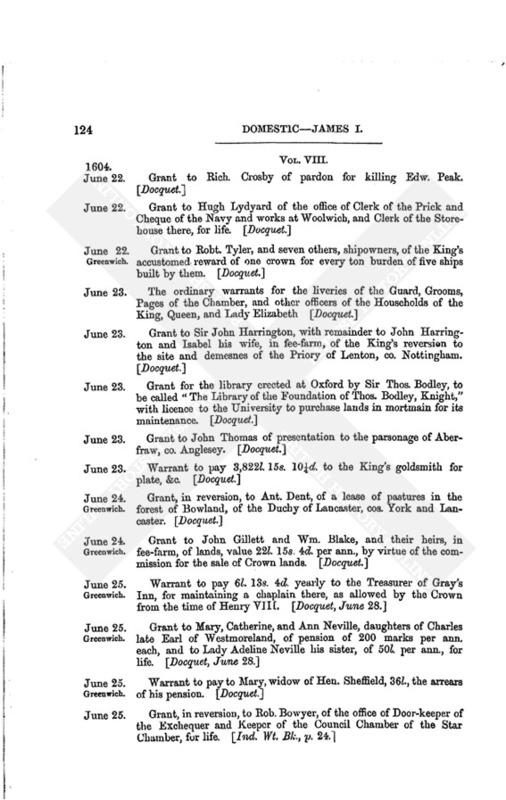 To obtain the King's signature to a grant prefixed of 600£. to Sir Wm. Stewart, out of the first payments made by him, in purchase of the fee-farm of the lordship of Ryce, Yorkshire; the 600£. being in lieu of a lease of the same for 60 years. 49. Statement of wrongs inflicted on Paul Triggs and Peter Collison, merchants of Exeter trading to Spain. 50. Similar statement referring to Thos. Taylor, and others, merchants of London. 51. 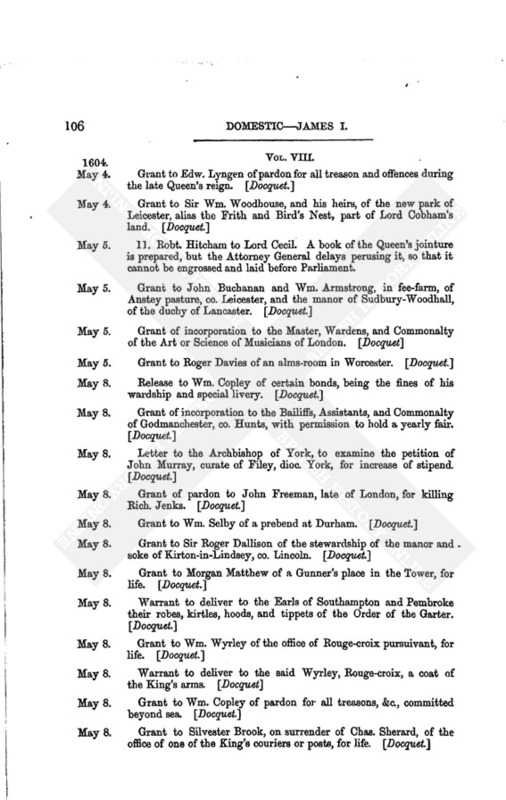 Memorandum of the Queen's powers in granting leases of her lands; the use of her Great Seal and Signet; her Chancery establishment, &c.
52. The King to the Lord Treasurer, Earl of Northampton, and Lord Cecil. Has refrained from granting to the Lord of Effingham, at his request, the lands of Wm. Shelley, attainted, that some composition might be made with the heir, who now offers to pay 1,000£. to Lord Effingham and 10,000£. into the Exchequer for their redemption. This offer is to be accepted, and the lands to be conveyed to Sir John Carill, Sir Hen. Guildford, and others, on behalf of the heir. 53. Warrant to pay to Sir John Spilman 6,422£. 9s. 7½d. for purchase of pearls from him and Wm. Herrisk, and for workmanship. 54. Lord Roxburgh to Lord Cecil. Attempts are making, through the Spanish Ambassador, to procure the restoration of Lord Both- well, banished for treason, which will be dangerous if they succeed. His own interest is involved therein. Begs Cecil to favour him with the King. 55. Notes of amendments to be made in the Act against Conjuration, Witchcraft, &c.
56. Proceedings in Parliament touching the Bill for Free Trade; with answers to various objections against it. 57. Copy of the above. 58. 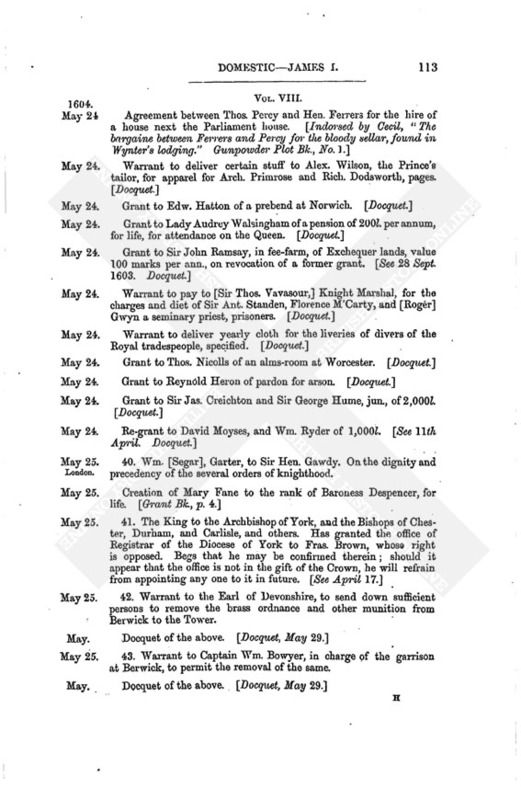 Remonstrance to Parliament by the Wardens of the Trinity House, and others, against dissolving the Company of Merchant Adventurers and throwing open the trade, showing the advantage they have been to the naval service. With a list of the ships built for them. 59. Memorial by the Russian Merchants to Parliament, in behalf of the continuance of their Company, and requesting that the trade be not made free to all. 61. 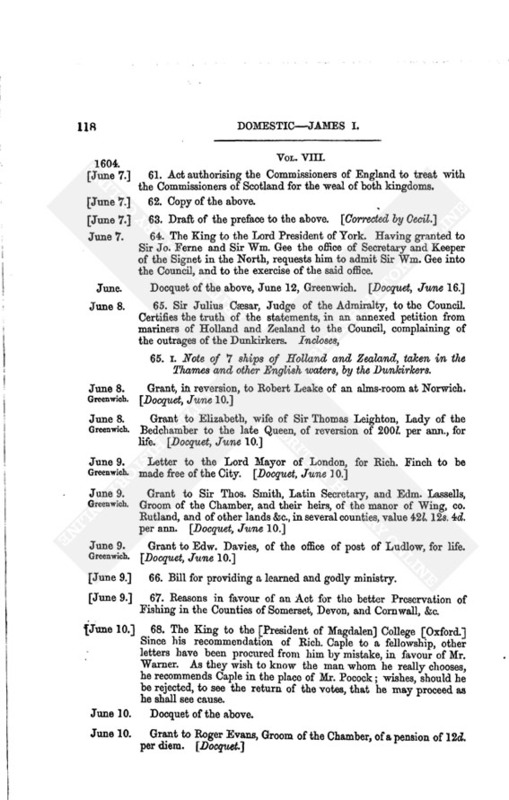 Act authorising the Commissioners of England to treat with the Commissioners of Scotland for the weal of both kingdoms. 62. Copy of the above. 64. The King to the Lord President of York. Having granted to Sir Jo. Ferne and Sir Wm. Gee the office of Secretary and Keeper of the Signet in the North, requests him to admit Sir Wm. Gee into the Council, and to the exercise of the said office. 65. I. 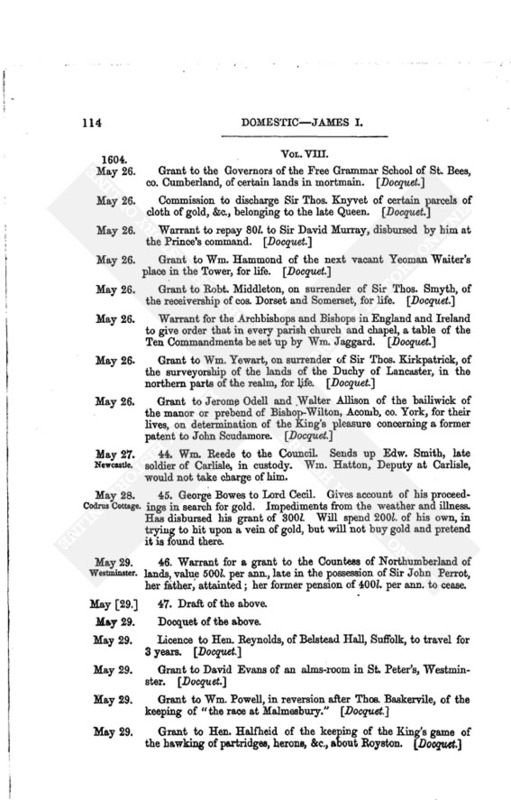 Note of 7 ships of Holland and Zealand, taken in the Thames and other English waters, by the Dunkirkers. 66. Bill for providing a learned and godly ministry. 67. Reasons in favour of an Act for the better Preservation of Fishing in the Counties of Somerset, Devon, and Cornwall, &c.
68. The King to the [President of Magdalen] College [Oxford.] Since his recommendation of Rich. Caple to a fellowship, other letters have been procured from him by mistake, in favour of Mr. Warner. As they wish to know the man whom he really chooses, he recommends Caple in the place of Mr. Pocock; wishes, should he be rejected, to see the return of the votes, that he may proceed as he shall see cause. 69. 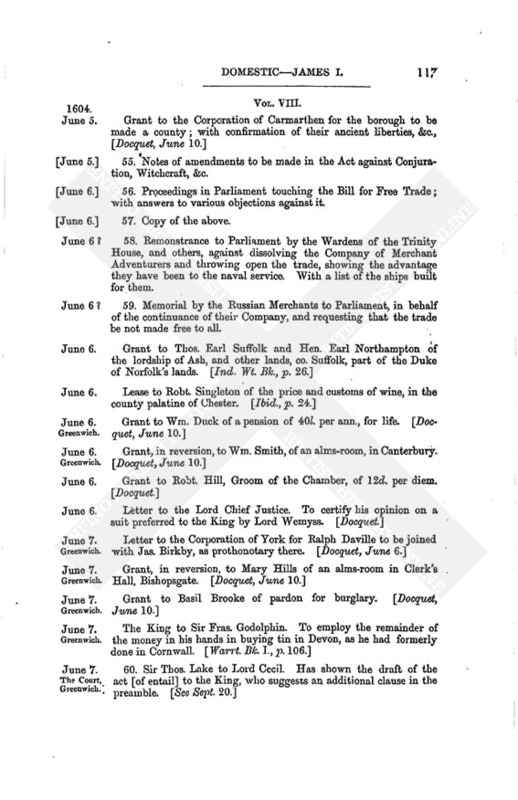 Notes [by Dudley Carleton] of arguments in the House of Commons for and against granting a subsidy. 71. Twiford Wathe to [Edw.] Anthony of the Signet Office. Is anxious to try a Court life; thinks it may be best effected through Sir Thos. Lake. 72. Grant to Augustus Duke of Brunswick Luneburgh, of pension of 500 marks per ann. 73. Warrant to the Court of Exchequer for payment of the above pension. Codrus Cottage, nigh Winlock Water. 74. Geo. Bowes to Lord Cecil. Details his proceedings in searching for gold. Sends a small quantity found. The reports that he has hit upon a vein are false, but he has found an old shaft not worked for more than 70 years. 75. Lord Cecil and Sir Roger Wilbraham, the Queen's Chancellor, to the Steward of Bisley. To hear the cause of Sibyl West against - Brush, who has obtained a reversion of her lease. 76. Survey of the manor of Lindhurst, co. Hants. 77. The King to the Commons. Desires them to proceed no further in the matter of subsidy, from fear of burdening the people. 78. Copy of the above. Printed. 79. Suggestions by Abraham Harderet for particulars to be entered in the patent to be drawn out for him, of the office of Surveyor of Jewels. With note by Sir John Stanhope of the King's pleasure, conveyed by Lord Aubigny, that the patent be made out accordingly. 80. Note of objections to the Bill against Recusants. 81. Intelligence sent to Sir Thos. Chaloner. Design of the Catholics to hold a convention of the most learned Jesuits, &c., to consult for their safety. Fathers Blackwell and Singleton to manage it. The main point, reported by Tesmond the Jesuit, not to be spoken of yet. Wynn is the informer. Threats uttered by Moore against the King. 80. Intelligence sent to the Same that letters have arrived from Father Coffin to the archpriest, [Blackwell,] Jos. Davies, and others, urging them to action. The King crossed about the Union. A Legate coming from the Pope to the King. 83. Anonymous [name cancelled] to Sir Thos. Chaloner. Desires that Davies be privately sent to the Tower. The keeper of the Gate- house not to let Woodward the priest have access to him. Feelings of the Papists on Lord Montague's commitment. 85. John Burges to the King. Is sorry that his sermon preached before his Majesty has given offence. Confesses that his remarks on the graciousness of princes and the impartiality of their favours were made, because the people murmured at the want of these qualities in the King. His conscience compelled him to make the remarks on religion, because of the growth of Popish ceremonies and the displacing of hundreds of godly ministers. Disclaims any intention of personal offence, and intreats restoration of the King's favour and release from imprisonment. 86. John Burges's declaration of his opinion on certain points of Church government, and that in his sermon before the King, he meant nothing personal towards his Majesty nor any one else. 87. Capt. Chas. Leigh to the Council. His arrival in Guiana. Settlement among the Indians; they are anxious for instruction. Prays for able preachers to be sent to them, and for the King's protection for emigrants to the colony. 89. Grant to Rich. Copiter, on surrender of Wm. Bareward, of the office of Water Bailiff of the Thames, from Staines House to the head of the river. 90. Reasons why the King and Lords should refuse assent to a clause in the Bill [for continuing, reviving, and repealing certain statutes] passed by the Commons, which concerns the prices of wines. The present vintners are bound to Sir Walter Raleigh, whose goods. are restored by the King. 91. Certain reasons why the King should continue to grant wine licences as heretofore. 92. Grant to Sir George Hume of the barony of Hume of Berwick. 94. French tranlation of the above, with a slight addition. 95. Petition of Sir Hen. Fanshaw, Remembrancer of the Exchequer, to the King. That the reversion of his office may be granted jointly to John Fanshaw and Nathaniel Ducket, both clerks in the office, and trained under himself and his father. 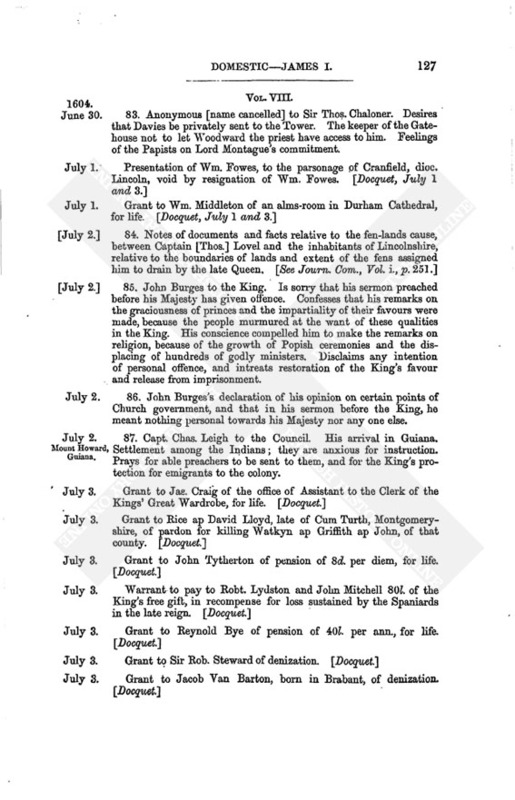 With reference thereon to the Earls of Dorset and Northampton and Lord Hume of Berwick; and their recommendation of the petition, though joint reversions are unusual. 96. 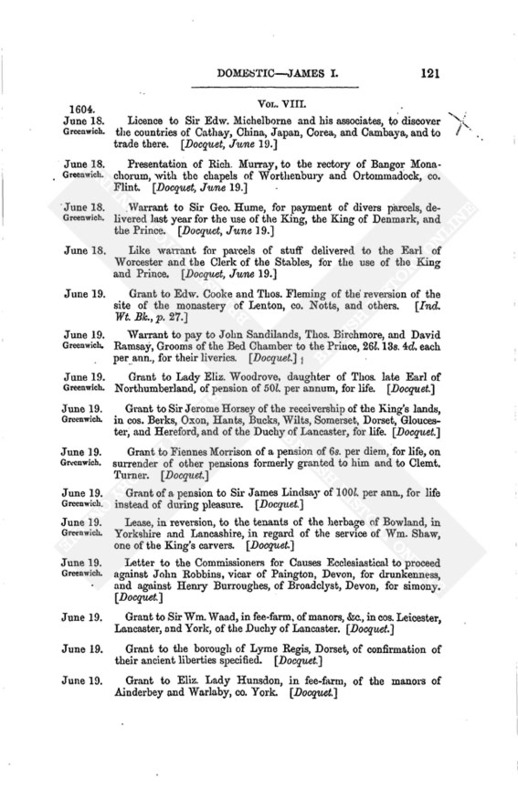 Names of such persons as lent money to the late Queen upon Privy Seals, not yet repaid, for the County of Essex. 97. 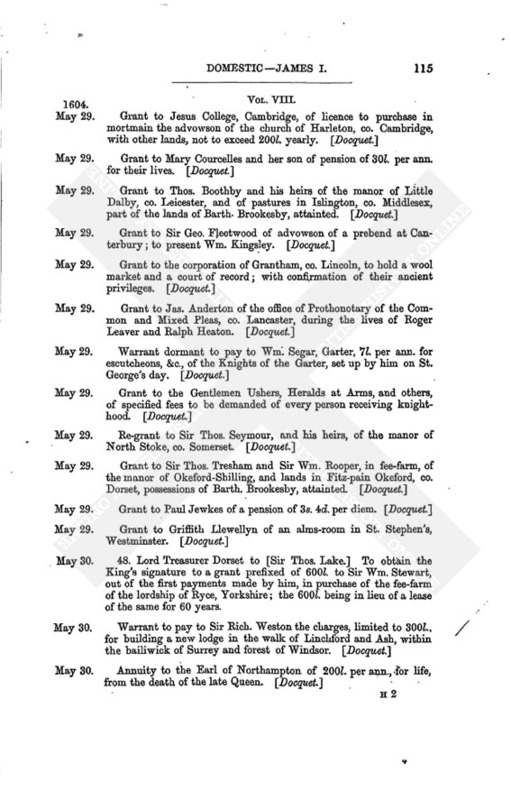 Similar list for the County of Hertford. 98. 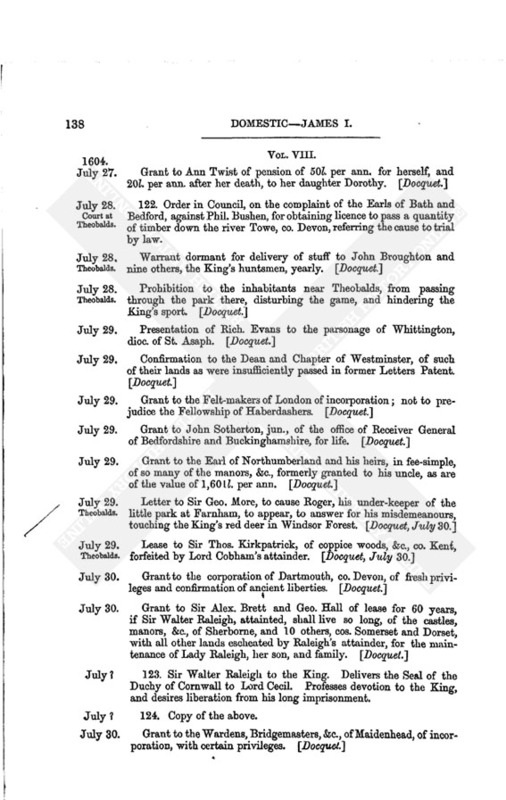 Duplicate of the above list for Hertford; with notes to certain names, showing those that are dead. 99. [Lord Cecil] to the Deputy Stewards of Kings-Norton. To protect Francis Heton in the enjoyment of a certain parcel of waste land, held by him of that manor. 100. I. 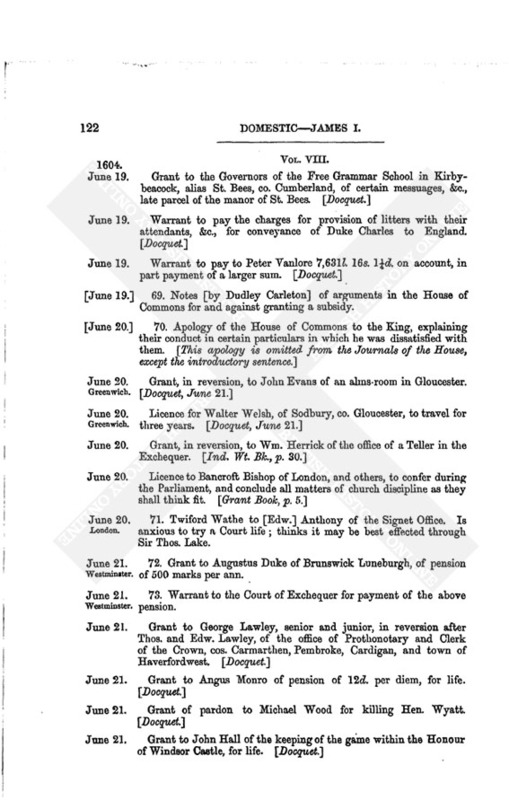 Act of the Parliament of Scotland, appointing Commissioners to treat with Commissioners of England on the Union of the kingdoms ; with a subjoined preamble of the Commission. 101. 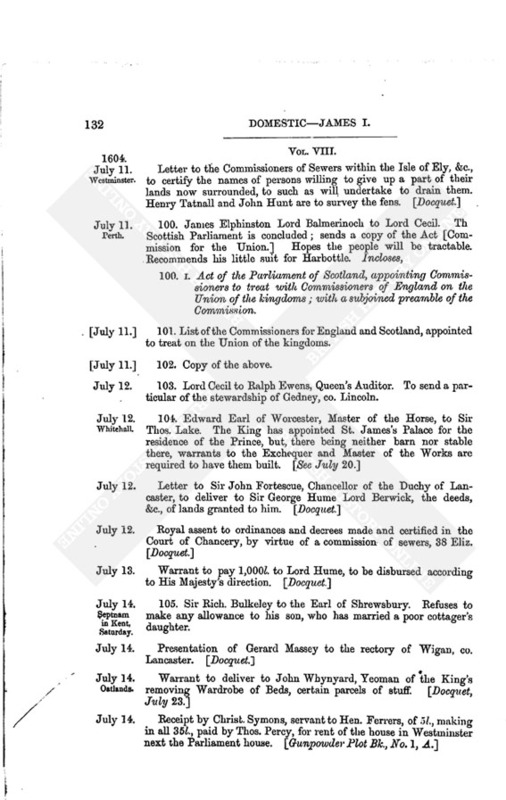 List of the Commissioners for England and Scotland, appointed to treat on the Union of the kingdoms. 102. Copy of the above. 103. Lord Cecil to Ralph Ewens, Queen's Auditor. To send a particular of the stewardship of Gedney, co. Lincoln. 105. Sir Rich. Bulkeley to the Earl of Shrewsbury. Refuses to make any allowance to his son, who has married a poor cottager's daughter. 106. Rich. Bancroft, Bishop of London, to Sir Thos. Lake. 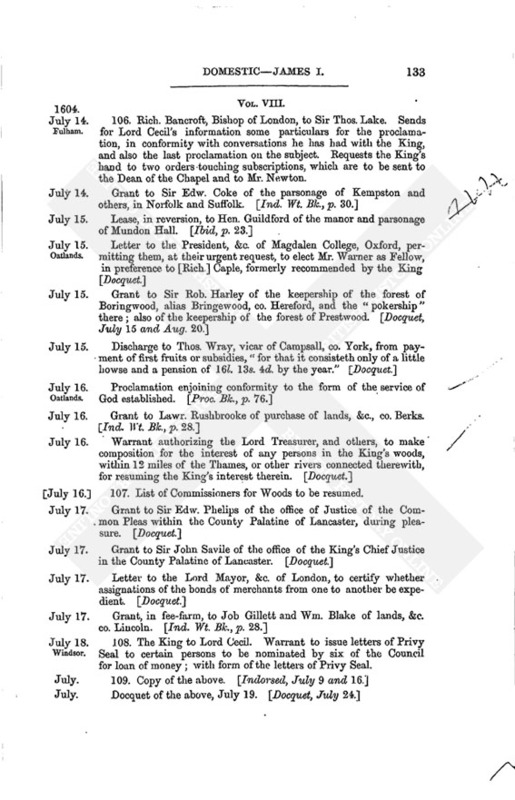 Sends for Lord Cecil's information some particulars for the proclamation, in conformity with conversations he has had with the King, and also the last proclamation on the subject. 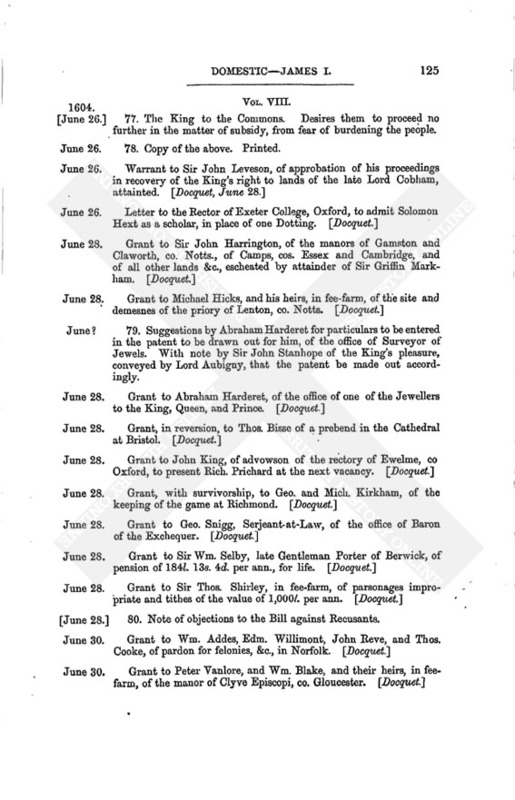 Requests the King's hand to two orders touching subscriptions, which are to be sent to the Dean of the Chapel and to Mr. Newton. 107. List of Commissioners for Woods to be resumed. 108. The King to Lord Cecil. 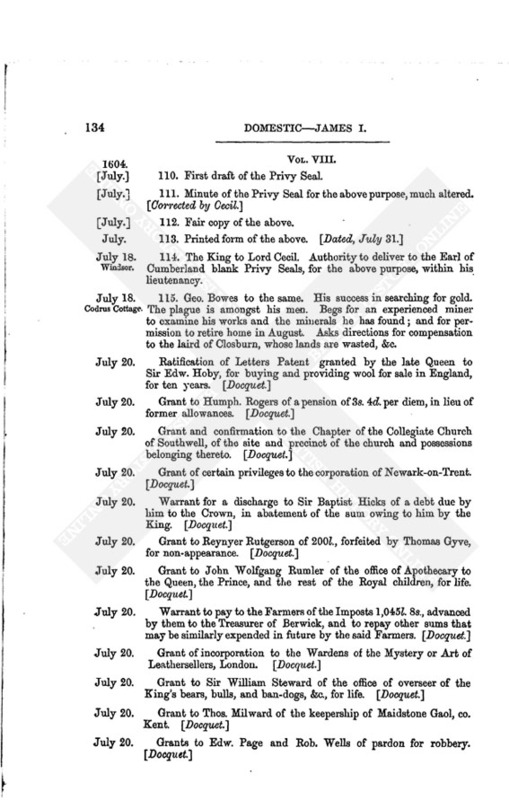 Warrant to issue letters of Privy Seal to certain persons to be nominated by six of the Council for loan of money; with form of the letters of Privy Seal. 110. First draft of the Privy Seal. 112. Fair copy of the above. 114. The King to Lord Cecil. Authority to deliver to the Earl of Cumberland blank Privy Seals, for the above purpose, within his lieutenancy. 115. Geo. Bowes to the same. His success in searching for gold. The plague is amongst his men. Begs for an experienced miner to examine his works and the minerals he has found; and for permission to retire home in August. Asks directions for compensation to the laird of Closburn, whose lands are wasted, &c.
116. Hen. Earl of Northampton to Sir Thos. Lake. To further Fras. Needham's suit for the reversion of an auditorship. 117. Warrant of a payment of 661£. 18s. 4d., by estimate of John Tavernor, for erection of a new lodge at Richmond, Surrey, viz. :- 231£. 18s. 4d. to Wm. 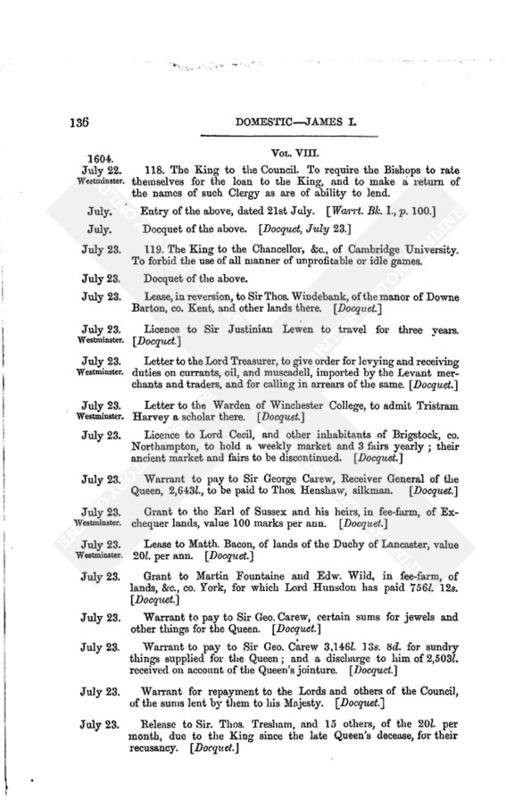 Christmas, Woodward of Hampshire, for felling and carriage of trees; and 430£. to Sir Thos. Gorges, Keeper of Richmond Park, for oversight of the work. 118. The King to the Council. To require the Bishops to rate themselves for the loan to the King, and to make a return of the names of such Clergy as are of ability to lend. 119. The King to the Chancellor, &c., of Cambridge University. To forbid the use of all manner of unprofitable or idle games. 120. Assignment by Thos. Beamount and Mich. Clarkeson, to Hen. Twyford and William Trumbull, of the keepership of the gaol and castle of York. 121. Copy of the above. 122. 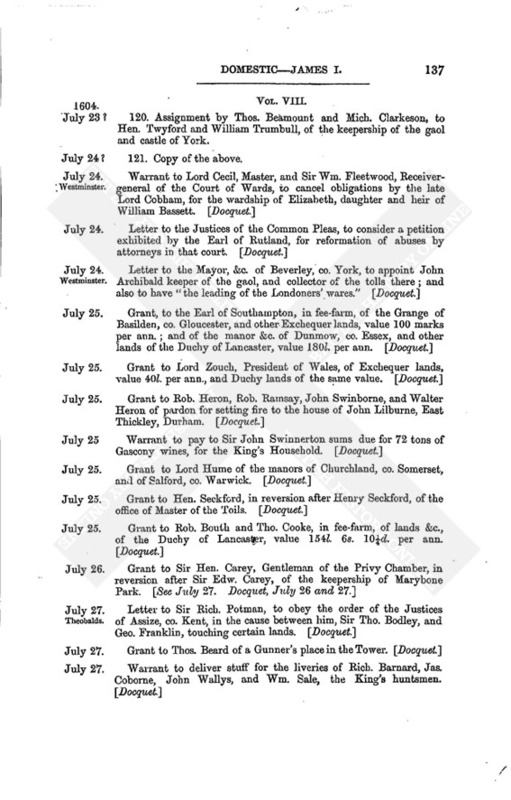 Order in Council, on the complaint of the Earls of Bath and Bedford, against Phil. Bushen, for obtaining licence to pass a quantity of timber down the river Towe, co. Devon, referring the cause to trial by law. 123. Sir Walter Raleigh to the King. Delivers the Seal of the Duchy of Cornwall to Lord Cecil. Professes devotion to the King, and desires liberation from his long imprisonment. 124. Copy of the above. 126. Fras. Tresham to Lord --. Conversation between Mr. Gage and Lord Buckhurst about the severe laws against recusants. Was requested by Gage to find out and reveal any Popish plots on foot, but knew of none. 127. Robt. and John Wingfield to Lord Cecil. Proceedings on the complaint of the tenants of Essendon of being over-rented and over-rated; propose a reduction of 21£. per ann. for their relief. 128. Precept to the Earl of Derby, and others, to allow Rob. Dalton, John Talbot, John Wharton, and John Ellis to work and search in his grounds, for mines and minerals, when the Dutchmen are not working. 129. The King to Robert Mason. Approves his tract called "The Anatomye of Oppression," and authorizes him to publish it. 130. 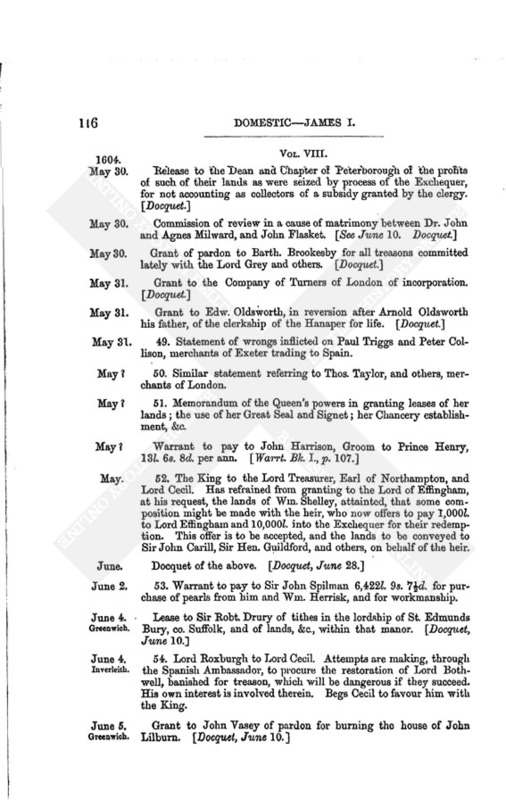 Statement of the causes why the customs of the port of London, &c., should not be demised in such manner as in the time of Customer Smith, i.e., with customs charged on goods brought from other English ports. 131. Extracts from statutes and arguments [by Lord Treasurer Dorset] to prove the importance of retaining the King's officers of customs to attend to the execution of the statutes, and to keep books of entries, that the King may know the true value of his customs, for guidance when the lease now to be granted expires. 132. Anonymous to [Lord Treasurer Dorset.] Observations on the points to be considered in letting the farm of his Majesty's customs. 133. Notes of sundry conditions to be imposed upon the farmers of the customs, for the benefit of trade. 134. 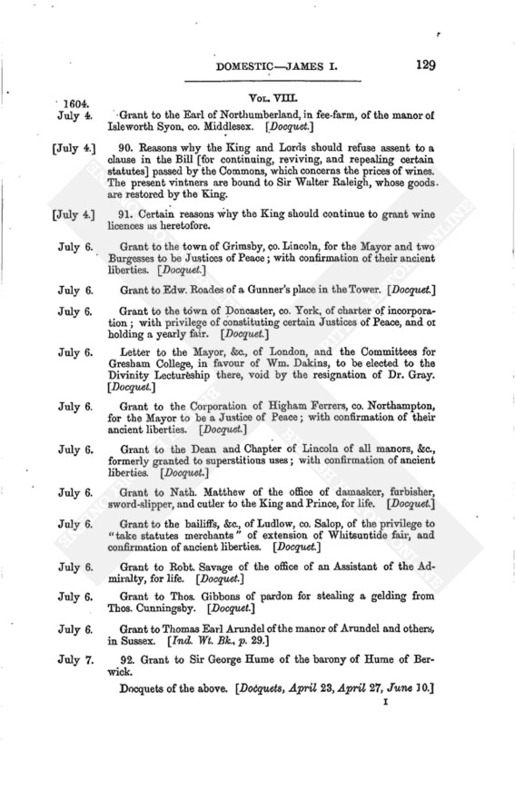 Statement [by Lord Treasurer Dorset] that the King has resolved to farm all his customs, both export and import, and has appointed commissioners to attend at the Custom-house three times a week to receive and conclude contracts. 135. Notes of consideration, in reference to new rates of duty to be imposed on certain articles of merchandize. 136. Tinners of Devon to Lord Cecil. Complain of the proposed renewal of the suspended Patent for the pre-emption of tin. 137. Tender of contract for the tin for 21 years, as the last farmers had it, paying 10,000£. yearly for the pre-emption. 138. Treatise relating to tin and the stannary customs, being "The substance of Gayer's booke touching the Tynn causes;" with replies thereon. 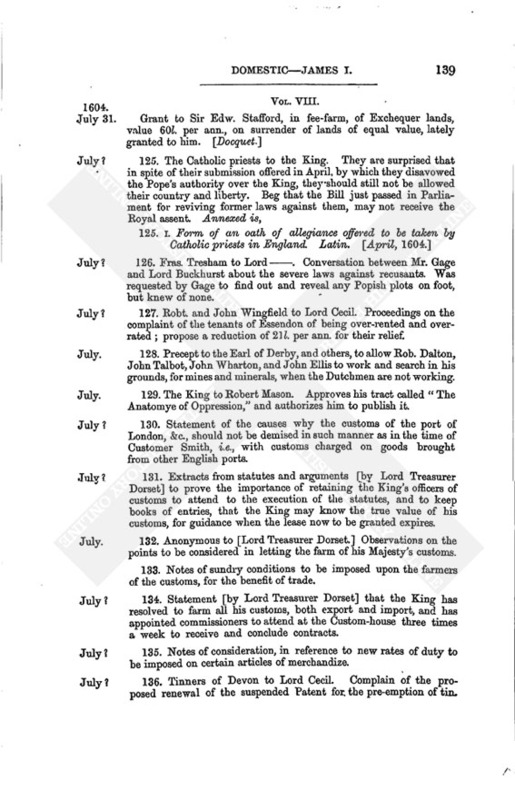 The king advised to favour the pre-emption of tin.